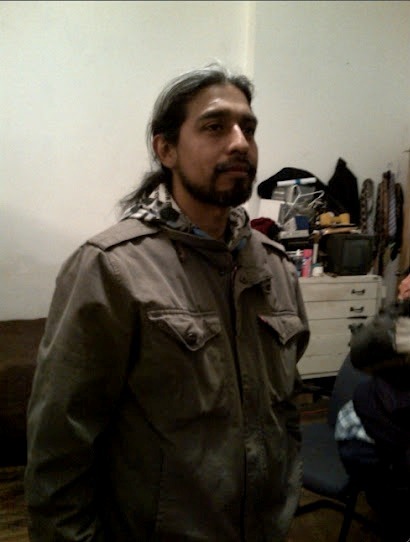 Saul Aguirre | Photo by Irish S.
We took a few minutes at "Short Court" to speak with Pilsen artist of many mediums, Saul Aguirre. Aguirre has been quite a force in the Pilsen art community since arriving there, and is currently helping to organize a show for some local artists in New York this summer. "I've been making art since I was young," Aguirre said of how he got his start in art. If he had to fix it to a number, he believes he started creating when he was around seven years old, a young boy in Mexico City, Mexico. In 1986, Aguirre moved to Chicago, where he has lived ever since. It was here where Aguirre "really opened doors" to his art career. He went to the Art Institute, where, as a student, he "was almost like being an apprentice." "I would ask, 'how do you use that?'" Aguirre said of the various tools and media his teachers used. "'What is that?'" Now , Aguirre does it all, a "multidisciplinary artist," who likes to work with all kinds of media. He uses his art to express ideas about the current social and political landscape, and to "visualize what's going on in the world," Aguirre said. 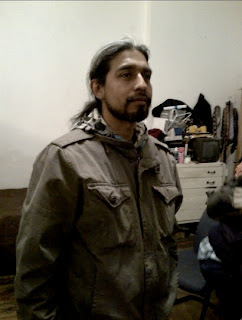 Aguirre has maintained an active presence in the local Chicago art community since moving into the Pilsen neighborhood. Chicago, he feels, suffers a lack of recognition by the larger art world. The more conservative tastes of collectors who are used to art-producing giants like New York City and Miami mean that they are not buying from Chicago artists as much. "For an artist to be here and work [only on art] is hard," Aguirre said, "there is no support system." As such, the artists have created their own support system, and are working to bring the rest of the world up to speed on the kind of art Chicago creates. It is up to the community, Aguirre believes, to decide to put Chicago on the map as an artist's city. Until then, Aguirre continues to do what he loves best: creating art, and helping build the art community. "I am not exclusive," he said. "I am for the community. Anyone needs me, I'm there." To learn more about Saul Aguirre, or learn more about his upcoming projects, clickhere!